How many times do we hear about devastating house fires in Brisbane, destroying homes and sometimes even claiming lives. Smoke alarm installation in your home and business is the single most important step you can take to protect not only your property but the lives of your loved ones. Unfortunately many people forget to check that their smoke alarm is even working as older models are dependent on batteries being changed regularly. Installing smoke alarms is both quick and easy and the electricians at Unified Electrical offer the latest photoelectric smoke alarm systems for maximum safety. all smoke alarms more than 10 years old should be replaced. While the legislation is being phased in according to a number of factors including when your home was built, Queensland Fire and Emergency Services now recommend smoke alarm installation in every room and hallway. 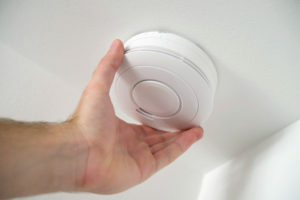 In addition, smoke alarms should be interconnected (so if one triggers all smoke alarms sound) and hardwired to your home’s mains power supply with a battery backup. To find out more about what the new Queensland smoke alarm legislation means for you, take a read of our recent blog post. You can also take a read of the Queensland Fire & Emergency Services fact sheet outlining the requirements in a bit more detail. Upgrading to a photoelectric smoke alarm really does make sense. They are the most effective early warning system of a fire at your property. Looking for smoke alarm installation Brisbane? Give the friendly team at Unified Electrical a call today for to install these life-saving devices and make sure your home and business are effectively protected. Which air conditioning system should you choose?